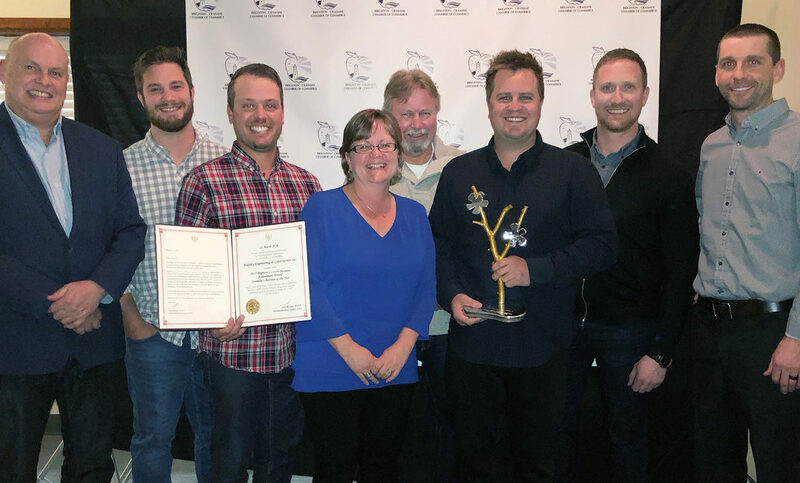 Photo Above: Left to Right, Cramahe Mayor, Marc Coombs, Brody Brown, Tim Williams, Jane Pillsworth, Ron Pillsworth, Jim Pillsworth, Rob Walker, Dave Arbuckle accept the Cramahe Business of the Year award at the Cramahe-Brighton Chamber of Commerce awards night. Inaugural Business Achievement Awards recognise the best in local business on many levels. 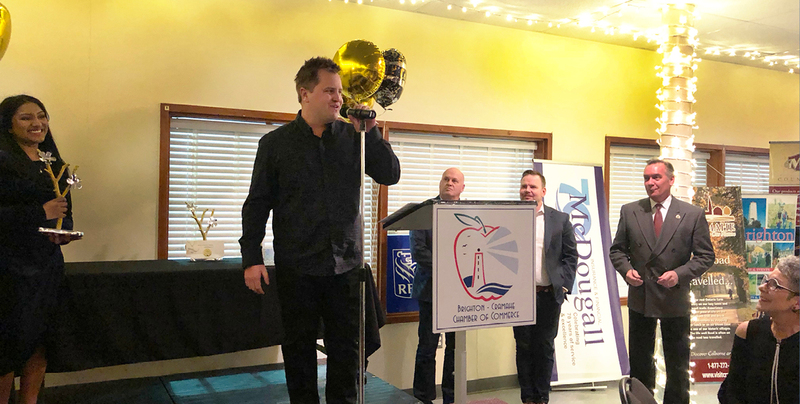 The Brighton-Cramahe Chamber of Commerce celebrated the inaugural, local Business Achievement Awards in partnership with the Municipality of Brighton, the Township of Cramahe, in style on Wednesday, March 21st at the Keeler Centre in Colborne. This event was initiated in recognition of local business growth and excellence. Offering a unique award is an ideal way to gather people together to celebrate their success, motivate, integrate and establish new connections in their own community. More than 120 guests and dignitaries attended the achievement awards at Keeler Centre in Colborne. The Fidelity Construction Team was the recipient of the Business of the Year Award for Cramahe Township. Jim Pillsworth, President of Fidelity was joined by the entire Fidelity team were on hand for the presentation. The Chamber Awards Committee who organized the evening mapped out the process and chose eleven awards to be presented in 2018. 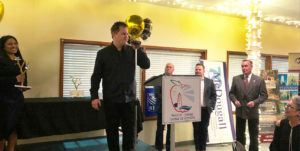 The award categories pay special attention to recognizing a Business of the Year and a New Business of the Year in each municipality (Brighton & Cramahe). There are seven other awards to recognize success behaviours and key sectors. Not-for-Profit and Agriculture are strong and distinct sectors that each have their own Award. The remaining 5 awards focus on Local Impact, Customer Experience, Health &Wellness, Environmental Impact and Innovation. The main goal is to establish a collaborative effort that recognizes excellence and promotes business activity that leads to growth in Brighton and Cramahe. It is intended that the location of this annual event will alternate between the communities of Brighton and Colborne each year. “The Award itself was created by Hoselton Sculptures as an original, exclusive and unique representation of the Brighton-Cramahe region “ says Chamber Manager, Sherry Hamilton. Curious as to when the new subdivision on Hwy 2 near the Esso is starting and who do we contact for home info. Where do we receive information on the constructions of those new homes?